We’d love your help. Let us know what’s wrong with this preview of There Was an Old Lady Who Swallowed a Fly by Pam Adams. There Was an Old . . .
To ask other readers questions about There Was an Old Lady Who Swallowed a Fly, please sign up. "Never swallow a horse." Period. This little book reminded me of a terrific rumor my classmates used to play on kids. They said that if you swallow a lemon seed, soon you'll have a tree inside your stomach. This idea used to terrify me back then, today I just chuckle thinking how much fun it was believing such stuff. This one is for my mum. As a child I giggled and giggled over this book. We did funny voices and everything. It still makes me laugh out loud today. I am just a big kid!! As a small child, I found this book incredibly worrying because of its potential influence on young, impressionable children. The old lady seemed senile, in my humble opinion, as she found new-age, questionable methods to resolve minor ailments that her body was more than capable of fixing without aid. I found the rhymes incredibly repetitive and dull, the same way I view song-writers that use the same word to 'make a rhyme' (e.g. 'If you're one of US | Then roll with US'). I also felt that her r As a small child, I found this book incredibly worrying because of its potential influence on young, impressionable children. The old lady seemed senile, in my humble opinion, as she found new-age, questionable methods to resolve minor ailments that her body was more than capable of fixing without aid. I found the rhymes incredibly repetitive and dull, the same way I view song-writers that use the same word to 'make a rhyme' (e.g. 'If you're one of US | Then roll with US'). I also felt that her reasoning sounded like a poor excuse for binge-eating and obesity. This children's classic was one of my niece's favorites. We had puppets and all to go with this lovely set that I must have read a million times ! I wish I could find the set to recommend this particular reading experience. The story is fun but the puppets added so much . I will keep looking. hahah i love this book! This story is completely absurd and totally hilarious. I really liked the illustrations in this particular book. Great read for the kiddos. This is a fun story to read to your class and is most likely aimed for lower key stage one children. The story is about a lady who swallows a whole list of animals (fly, spider, bird, cat, dog, pig, goat, cow, donkey and a horse). The lady keeps swallowing animals to catch the last animal she swallowed. The comical element of the story is that the lady dies after she swallows the horse however she should have died after swallowing the bird. When telling the story to young children the words can be turned into a song which adds to the enjoyment element. The design of the book is also interesting and engaging for younger viewers as there are purposely created holes to see into the ladies tummy and all the animals she has swallowed. I read this book to a class of year one children and there was a lot of laughter throughout the book. I strongly feel that this story could motivate children when reading and therefore supports children reading for pleasure. This book tells the story of an old woman who swallowed a fly, spider, bird and a cat. 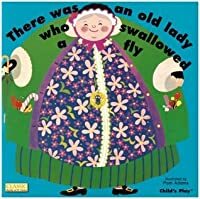 This book follows a pattern; 'I know an old lady who swallowed a ...', which is attractive from the point of view of teaching rhythm and rhyme. However this is an extremely basic book, which could be infantile to the more advanced Primary 1 child, who would therefore gain little from having this book read to them. Thus this book may be more suited to the nursery classroom rather than the early primary setting. This book tells the story of an old woman who swallowed a fly, spider, bird and a cat. 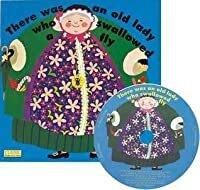 This book follows a pattern; 'I know an old lady who swallowed a ...', which is attractive from the point of view of teaching rhythm and rhyme. However this is an extremely basic book, which could be infantile to the more advanced Primary 1 child, who would therefore gain little from having this book read to them. Thus this book may be more suited to the nursery classroom rather than the early primary setting. On the one hand: this book is much better than all the endless "There was an old lady" sequels with the terrible illustrations and unfunny jokes. On the other hand: it's hard to read if you don't already know the song by heart. Which you probably do. On the one hand: my children love this version. They would have me read (or actually sing) this book every single night. This is probably one of their top five books. On the other hand: I am so sick of it that I would kind of like to set it on fire in On the one hand: this book is much better than all the endless "There was an old lady" sequels with the terrible illustrations and unfunny jokes. On the other hand: I am so sick of it that I would kind of like to set it on fire in the back yard. A wonderful read from my childhood, one I’d certainly suggest for other youngsters. Whilst it is not my all-time favourite childhood read I can still recall all the details of this one meaning it certainly left a lasting impression upon my young mind. And isn’t that what we want with children’s books, for them to leave a positive lasting impression? A perfect read for a baby/toddler as the repetitive tone of your voice keeps them captivated along with the bright colours on the pages. This book is awesome - we had it at playgroup when I was little and I just found a copy at a yard sale for my 2 year old and she loves it too! Characteristics that Support the Genre: Rose Bonne’s poem is cleverly illustrated by Pam Adams, who captures the lightheartedness and visual interest to make this particular version of the story a book to be read and looked at again and again. Organization: The logical progression in the book and illustrations is that the old lady just swallows bigger and bigger things, adding to the humor and fantasy of the story. Word Choice: The words of this poem are silly and sweet, such as the spider who “wriggled and jiggled inside her”, clearly creating images for the listener. Sentence Fluency: There is natural rhythm to the poem, which has several “verses” and always ends with the chorus of “I don’t know why she swallowed the fly. Perhaps she’ll die” (until the end, when she swallows a horse). Again, just silly and nonsensical humor! Conventions: The font is simple, bold and clean with short sentences to support the illustration. Presentation: The best thing about this book is the presentation. As you turn each page, presenting a new critter the old lady has swallowed, there’s a cut-out in the center of the page, showing the fly, the spider, the cat, etc… with the words encircling the cutout. Classroom Integration: This would be a book to read after teaching the song so kids could match the words with the music and support their reading/spelling skills. Finally!!! I've been hoping to come across a copy of this book, and it happened today. Best of all, it's in almost new condition. There must be dozens of different versions of this same idea, but none of them is better than this. The illustrations that show what's going on inside that silly woman's stomach fascinate the little kids. When the old lady dies (of course), we always agree that this is just a silly story and the lady was always imaginary. No one would ever swallow all of those things! Finally!!! I've been hoping to come across a copy of this book, and it happened today. Best of all, it's in almost new condition. There must be dozens of different versions of this same idea, but none of them is better than this. The illustrations that show what's going on inside that silly woman's stomach fascinate the little kids. When the old lady dies (of course), we always agree that this is just a silly story and the lady was always imaginary. No one would ever swallow all of those things! I know that this book is a classic. I think that this book was weird and disturbing in a funny way. I think that it was a nice change compared to other books. The illustration in this book is amazing, I like how they show you pictures of what the old lady in the book was swallowing. I think that this book is perfect for reading aloud. This book is perfect to teach little ones to not put everything in their mouth. Original Summary: A sequential story of what happens when an old lady swallows a fly, and then tries to catch it. Original Review: This book is good for young children as it is sequential and repeats itself. It is funny and interactive as there is a hole on each page showing the old lady's stomach and what is inside. In-Class Uses: This book can be used for sequencing events. Original summary: There was an old lady who swallowed a fly... and a spider... and a bird... and a million other crazy things. Original review: This classic repetitious song allows children to play with structure in a new fun way. 1-2 possible in-class uses: This could be used to teach different types of structures of songs or poems. I absolutely loved this book when I was younger and probably would still love it if I were to read it today too. It made me laugh when I was reading it and I wanted to read more which wasn't something that was happening a lot to me when I came across this book. I think this book is just something fun to read with your class to get them involved or just to take some time to have fun throughout the day. The illustration is good and colorful. 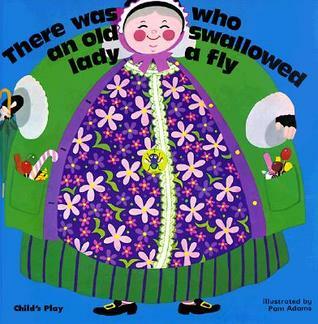 The illustrator created a hole in the old lady tummy and the children can see what kind of creatures the old lady swallow. The story is funny and the repetitive sentences can boost the children's memory. Children will enjoy and have fun when they can do it on flannel board. Children would definitely enjoy this book because it is so silly. The main character in this story is the old lady. The old lady is the one that swallowed the fly, spider, bird, cat, dog, cow, and the horse, it's very entertaining because children know that a lady could never swallow a cow or a horse or any of those objects in real life. The children in my class love this book. It increases imagination and creative reading. In between your reading its a good idea to stop and ask questions, allow the children to come up with their own solutions as to why she swallowed the fly. This book also increase listening skills because you can ask what did the old lady swallow first? second? third? I absolutely loved this book when I was younger and probably would still love it if I were to read it today too. I think this book is just something fun to read with your class to get them involved or just to take some time to have fun throughout the day. This is a classic book that I remember reading when I was in school. It has great nursery rhymes that children can pick up on. It is also really funny which allows the children to be more engaged in the story. This hilarious book introduces silly repetitive phrases that rhyme. I love the humorous illustrations in this story which children are drawn to. This story introduces animals as well as a variety of descriptive adjectives and teaches children new words to express themselves. A classic folk tale retold in a fun style. The illustrations have holes cut in the pages to show what is in the lady's tummy. This book repeats the further you go through it making it so the children can contribute to the story by repeating lines. This is a classic story with lots of humor. This book offers colorful and engaging illustrations. Young children would enjoy this old classic because of its silly nature. However, it may be a little morbid because...well, the lady who swallows the fly -dies. This is a funny book. It teaches nursery rhymes and have great illustration . It teaches names of animals. Teachers can cut out animals in the story and encourage the children to glue the animals in order the old lady swallowed. This book is great at engaging students into listening to stories. It's very interactive and colorful which is great if reading to younger children. I would have an activity to go along with this book. I would have my students draw what's in the old lady's stomach as we're reading. One Unique Feature: This books unique feature is that there are "holes" in the pages of the book to add effect to the story!